SPECIAL ORDERS ARE OUR SPECIALITY! 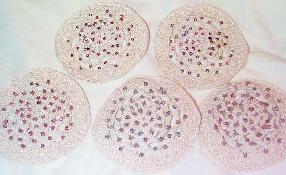 Order assorted colors or matched sets for the special ladies and or men for you Simcha. 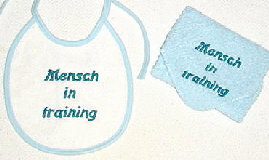 Bris/Brit and Baby Naming Kippot and Headcovers. Also solid (non lace) headcovers that can also be used by women for the High Holidays etc. 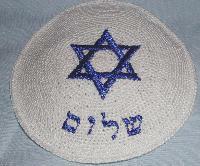 Order a special kippot for the Groom, his attendants and special family members. I love making BRIDE and GROOM Sets! 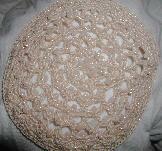 Many of my kippot can be used by Brides as a head covering or with an added veil. You can add your own veil or email me to design a veil for you. SIMCAH ITEMS TO INSPIRE YOU! 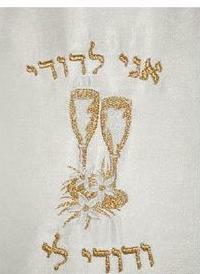 Including a trimmed and beaded tallit I made for myself for my son's bar mitzvah. Personal service is important to me. Email me with your design questions. We can design a kippah together. 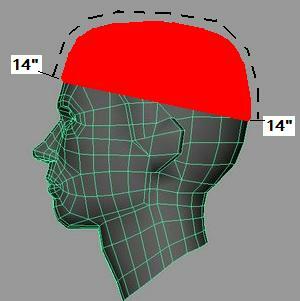 How to measure your head for the perfect fit. Diagram drawn by customer George. 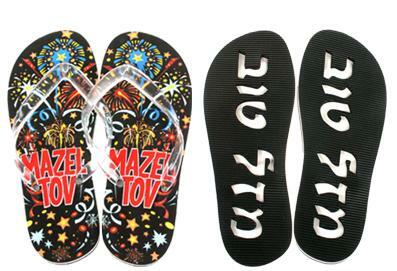 Flip Flops for bridal maids and other groups. Checks, Master Card, American Express and Visa Accepted. Credit cards accepted through a secure site at PayPal.com. This seal says that PayPal has verified my identity. Pansy - 200 special beads crocheted into the design! Flowers with 200 to 400 E beads. Great For Very Special People or Occasions! Custom headcovers for all occasions can be ordered. 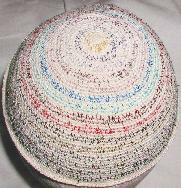 How is a Chadis Crafts's Kippot Made? All are uniquely designed and sized. 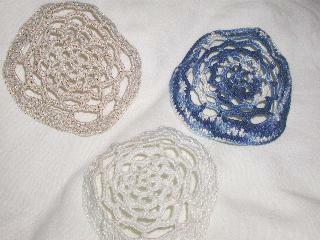 Each kippot takes from 2 to 4+ hours to crochet. (Some of the full head covers can take 3-5 evenings to make! With a few acryllic blends. Most pictured styles can be made in other colors. Yarmulkas/kippot are also available in many colors to match your outfit or tallit. Also threads are available in different thicknesses. I now have over 20 new colors of nubby metallic and rainbow threads to hand spin into my cotton threads! 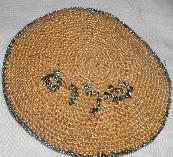 Great for ladies and men's kippot. 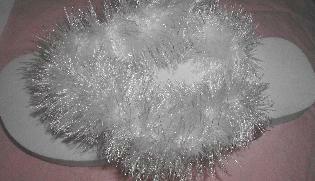 They can be used with any thickness of cotton thread. UPDATE! I now also have a few of these metallics in a 4 ply (thicker) thread. Great for trims and to crochet into thick cottons as stripes. Great even on men's full head covers. 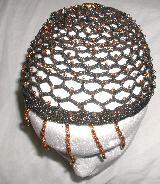 I especially enjoy crocheting Kippot that have woven 3d designs. New items are being added often.